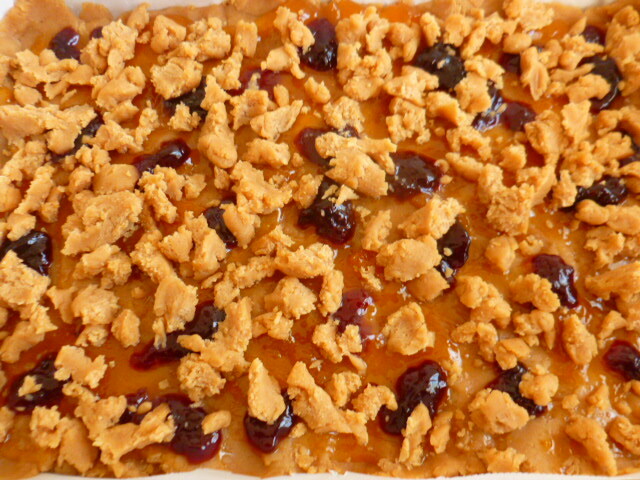 Quick and easy to prepare, these tasty bar cookies will please anyone who loves the combination of peanut butter and jelly. 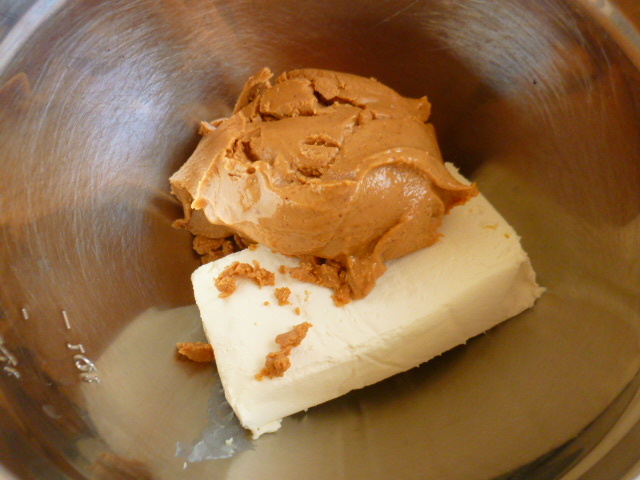 For the dough, I chose to use cream cheese instead of butter, which, combined with the peanut butter, created a unique flavor and texture. To make things even more interesting, I used two types of jam, with different colors and flavors. 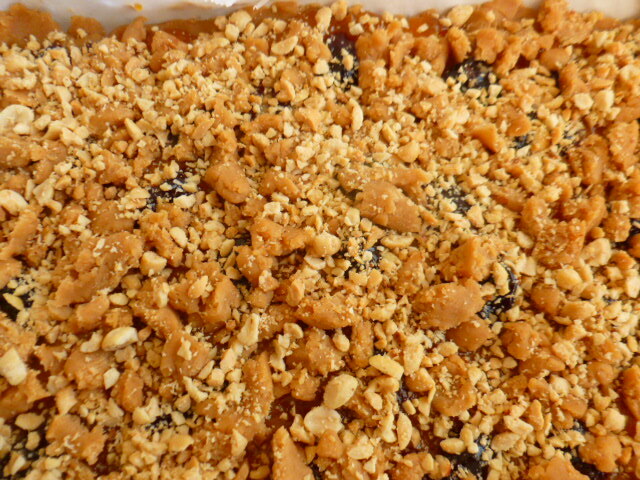 The jam layer was then topped with a bit of crumbled dough, and crushed salted roasted peanuts, which added a nice crispy texture, and light saltiness, that balanced the sweetness beautifully. Cut into any size you prefer, these bar cookies are perfect for brunch, or as a snack any time of the day. Try them and enjoy. 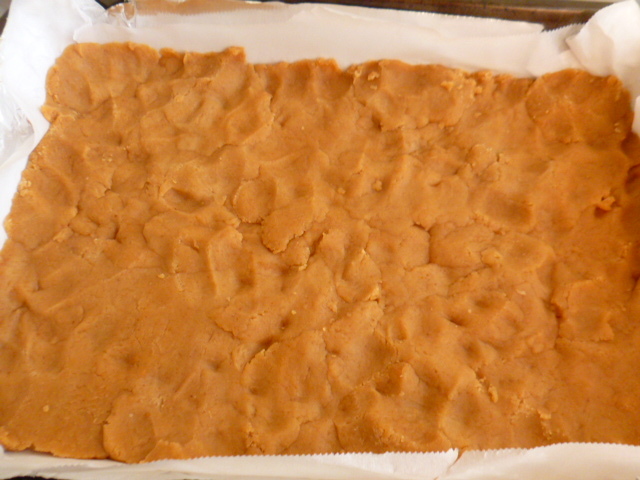 * If you prefer sweeter cookies, use sweetened peanut butter instead of the unsweetened one I used. 1. 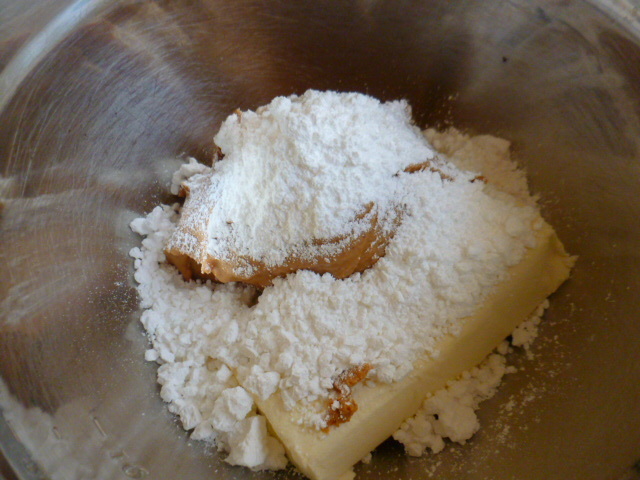 Place the cream cheese, peanut butter and powdered sugar in a large bowl. Mix with a hand mixer to combine. 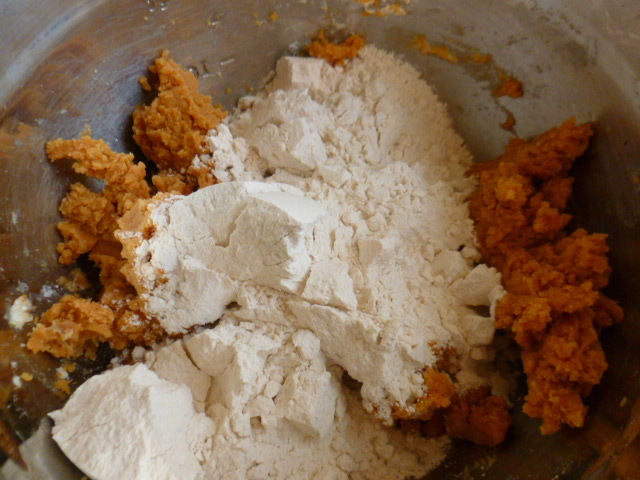 Add the flour and knead, adding milk as needed, to create a soft dough. Wrap with wax paper and place in the fridge for 1 hour. 2. Preheat the oven to 350F (175C). Line a 7”x11” (18cm x 28cm) baking pan with baking paper. 3. 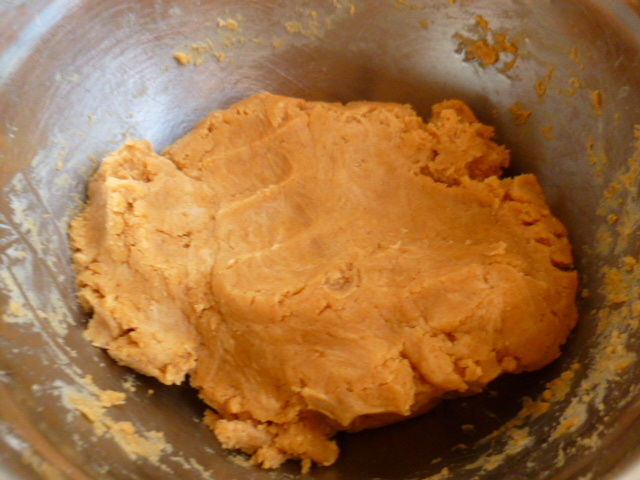 Press ¾ of the dough over the baking paper. 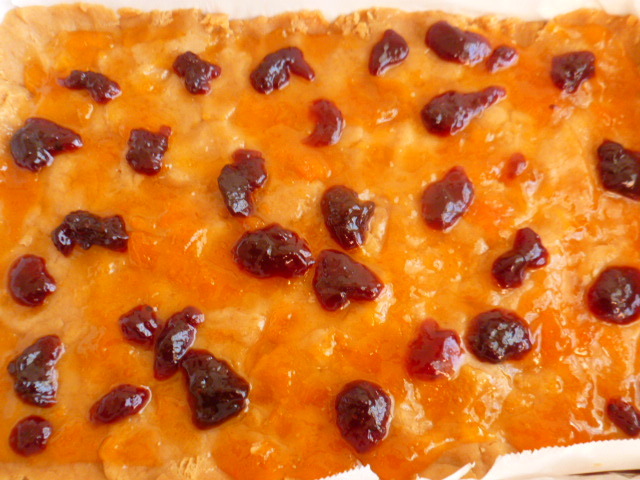 Spread the apricot jam over it, and then add dollops of the red jam on top. 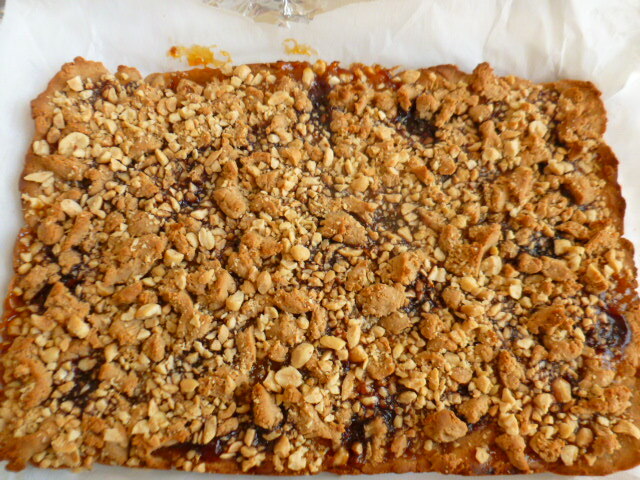 Crumble the rest of the dough over and scatter the crushed salted peanuts all over. 4. Bake for 40 minutes, until the top is golden brown. Cool on a rack to room temperature before cutting. Yummm, I love peanut butter and jelly! Will add this to my to-try list :) Thanks for sharing the recipe. May I ask how do you keep the leftovers? Thank you, I’m glad you liked the recipe. Thanks!! I shall try this after my skin gets better, currently I am avoiding peanuts – can’t wait! Yum-Yum-Yum I am a peanut butter a jelly freak!!! Thanks you for this recipe! Oh my goodness Ronit! I love this! I will have to make some! Wow, these look super delicious, I like the crunchy top layer over soft dough. I’ve been making my own peanut butter lately. What a great way to use it! Never ate a PP&J sandwich but I would love the combo in this bar cookie as there are so many other goodies. These look great. Are there any other dessert recipes I should try from your blog? Great recipe Ronit and I love the idea of using cream cheese in place of butter – certainly something to try in other recipes too! wow! well I’m printing this recipe, and I can’t tell you how few sweet recipes I’ve printed from blogs over the years. Very few! These bars are fun, and I love that they’re not overly sweet. Who wouldn’t like peanut butter and jelly?!! These bar cookies look yummy. 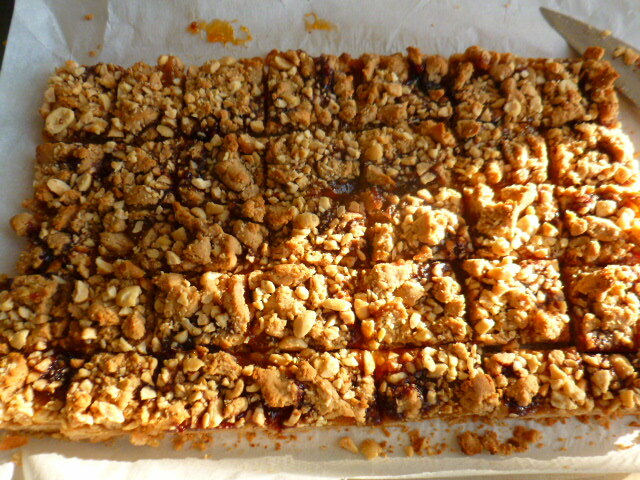 I often make bar cookies.They are so easy to make and versatile. They are perfect for picnics, pot lunch dinners, luncheons, snacks, etc. Your cookie bars look so good. 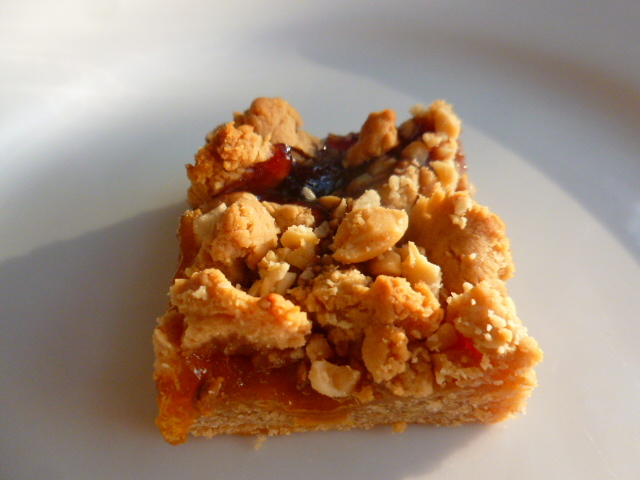 It’s like a peanut and jelly sandwich with peanut cookies and the added crunch of the roasted nuts. Pure yum! Looks yum! I love peanut butter..
Looks like a great dessert bar! Yum.